Activists have been pleading with me to help provide the tools they need to stand up to national and international planning groups, elected officials and the news media in their fight to stop Agenda 21 in their communities. I have heard you and have responded! 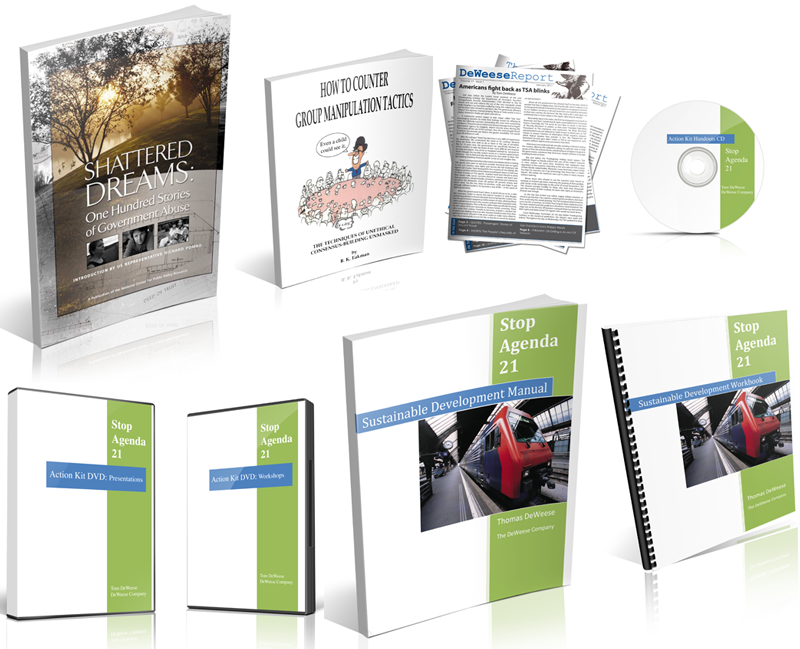 Two DVD sets, including two workshops; 3 manuals; 1 workbook; and a special power point presentation. Everything you need to know all the details on how to fight back against Agenda 21. · I’ve outlined the treaties, policy papers and international meetings that have set the agenda. · I’ve shown how those international policies go directly into local communities, disguised as innocent-sounding development projects or historic preservation – drastically changing our way of life. · I’ve revealed how those International plans are moving past Congress and into local communities. · I’ve detailed how the Supreme Court has helped them do it. · And I’ve exposed the private organizations that are able to take control of your community and enforce these policies, without a vote or any input from you. · How international policy is directing local communities to enforce cutbacks on water use by as much as 75%. · The actual definition of a “Soviet” and how international organizations are at work right now in your community, enforcing policy to turn your town into a little soviet of non-elected boards, councils and regional governments answerable to no one. There’s more – much more. · Did you think Obama’s health care policy is his brainchild? Of course not. Again, it has international roots. I will show you the direct connection and the true purpose behind the planned destruction of America’s health care system. Trust me – the reports of health care rationing and death counseling are very real. I’ll show you where these ideas came from. · Did you think it was Ronald Reagan who killed the Soviet Union? I’ll give you the details on how Gorbachev himself did it – and I’ll tell you why. · Did you think your children aren’t learning because there isn’t enough money and teachers in the classrooms? I’ll show you that the dumbing down of American children is done on purpose and that the schools are operating perfectly – for what they have been “reformed” to do. · I’ve provided details on how the “consensus” on global warming has collapsed. · I’ve provided stories of some of the victims of these tyrannical policies and how they have been robbed of their property and livelihood -- simply because a government thug has too much power. I relied on these experts along with several of the leading activists who are on the front lines fighting Agenda 21 from the state house to city council chambers. Other “experts” are missing the core threat. It’s not discussed in the media, newsletters or national conferences. Even many TEA Party rallies. But it is revealed in detail in the Stop Agenda 21 Action Kit. · How our language is being manipulated to control policy. · The threat we face is not a Republican or Democrat issue. · The ruling principle that will completely reorganize our society. · The three E’s of the “Sustainable” collective. · The threat of the “precautionary principle,” and how it will destroy our economy. · The diabolical plan behind Bill Clinton’s “reinvention” of government and the disastrous affects on our nation today. · How Public/Private Partnerships are destroying free enterprise. · Little known details about ICLEI, the international organization that is taking over most American cities and running them without voter input. · How the politically-based radical environmental movement uses fear of environmental damage as camouflage while they work to transform the American systems of government, justice and economics. · How the “death” of the Soviet Union actually freed its leaders to expand their power and influence over the world. · The dawn of “Common-ism” that transformed national sovereignty, natural resources, and private land into “common property” for the global commons. · How the public education system has been transformed to create global village idiots. · The four international commissions that are transforming the world towards global governance. · The full definition of an NGO and where these privately-funded groups get their power. · The most powerful environmental group in the world and why it’s the most dangerous. · How UN policies become American law. · The Charter for Global Democracy and how its 12 principles are being fully implemented to create global governance. · The Smart Growth fraud. · The lunacy of the Wildlands Project. · How “green” industry and “green” school houses are costing taxpayers millions in additional costs -- with no benefit. · I’ve revealed how those International plans have moved past Congress and into local communities. All of these details are included in the special MANUAL of the Action Kt. But there is more – much more! 1. One hour overview presentation of Agenda 21 – this is my speech that I have been delivering across the nation to ever-growing, enthusiastic crowds. 2. One hour presentation by Michael Coffman, connecting the dots between Agenda 21 and other issues that we face. 4. One hour presentation by education expert Michael Chapman, detailing how the public education curriculum is being used to train children to accept the policies of Agenda 21. 1. Beverly Eakman teaching how to stop the group manipulation tactics of facilitated consensus meetings. 2. Dan Byfield of American Stewards of Liberty teaching how to use an exciting new tool called “Coordination” to stop federal and state policies from invading your community. 1. Details on how to fight back against Agenda 21 policies on our community. 2. Actual sample legislation to protect property rights and repeal Sustainable Development legislation that has been introduced in state legislatures which you can present to your state legislator. 3. A side by side review of actual comprehensive development plans to show their direct ties to Agenda 21. Use them as a guideline to compare your own community’s plan. 4. A sample anti-Agenda 21 resolution that can be used at local and state party conventions to add to party platforms. (This is the actual anti-Agenda 21 resolution passed unanimously by the Republican National Committee). 5. A sample petition to be used in your community to oppose Agenda 21 policy. 6. How to begin researching if Agenda 21 policy is in your town. 7. How to create a “Property Rights Council” for your County Commissioners to assure all legislation protects private property rights. 8. Hand out flyersthat can be copied and presented at public meetings. 10. A speaker’s bureau featuring a list of speakers from around the nation qualified and ready to attend your public meeting to discuss the dangers of Agenda 21. Beverly Eakman’s fullmanual on stopping Consensus meetings. 1. This works perfectly with her DVD workshop presentation. A manual providing several short stories detailing the victims of Agenda 21 polices. 1. The proponents of Agenda 21 and some elected officials constantly insist that their policies hurt no one. This manual will prove otherwise. The Action Kit itself is a $250 value. But you can get a full copy now for $195. Plus I’ll include some valuable extras. First, I’ll supply regular updates to the Action Kit as new material comes available –FREE! That means the Action Kit will always be fresh and up to date. This Action Kit represents 18 years of my most dedicated work and accumulated knowledge. Moreover, it contains special reposts and presentations from my closest advisors and colleagues – the most knowledgeable experts in the field. You will not find this information anywhere else. I urge you to act quickly. Agenda 21 is already entrenched in most American cities. If allowed to continue, our style of government, indeed our way of life will be destroyed forever. We can beat it – now – if we all understand exactly what we are fighting and how to fight back. 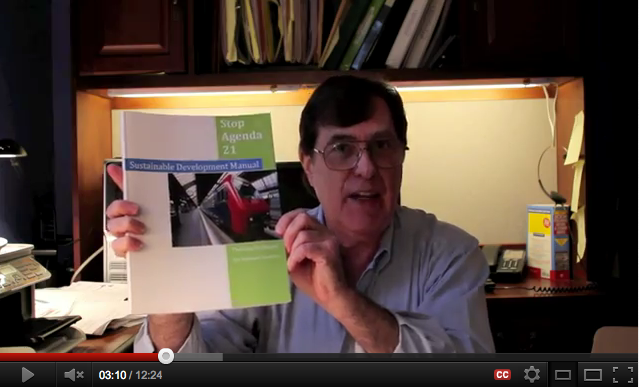 To do that – you need my Stop Agenda 21 Action Kit!